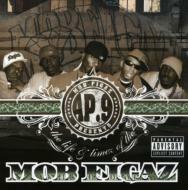 AP.9 is back with THE LIFE AND TIMES OF MOB FIGAZ. This is not just another greatest hits album, this is a trip down memory lane with AP.9 weaving stories about the Mob Figaz, like how they first met, how they hooked up with C-Bo, their trials and tribulations and the loved ones they have lost in the streets. 18 Smokin tracks featuring C-Bo, Killa Tay, Lunasicc, Yukmouth, 3X Crazy, Mac Dre, King Freako and the Mob Figaz.